One product from the sugar cane is brown sugar cane. ‘UKM Bumi Asih’ is one of the producer of the sugar cane in Bondowoso Regency. Brown sugar cane has potential prospect to developed because it can be used to any purposed (for household needs and beverage industries). This study was aimed to identify the internal and external factors that affected business development of brown sugar cane. The study were used the methods of internal factor evaluation (IFE) and eksternal factor evaluation (EFE). Internal factor analysis was performed to identify the company's internal strengths that can be used and anticipated weaknesses. External factor analysis was conducted to identify opportunities that can be exploited and threats that can be avoided. The scores output from matrix IFE and EFE were all categorized with total score 2.812 for internal factors and 3.0315 for external factor. Both scores were above 2.5 which meas that the internal position was strong enough. So its has the ability above the average to take advantage of the power and opportunities to anticipated the internal weakness and the threats. SUBAKTILAH, Yani; KUSWARDANI, Nita; YUWANTI, Sih. ANALISIS SWOT: FAKTOR INTERNAL DAN EKSTERNAL PADA PENGEMBANGAN USAHA GULA MERAH TEBU (Studi Kasus di UKM Bumi Asih, Kabupaten Bondowoso). JURNAL AGROTEKNOLOGI, [S.l. ], v. 12, n. 02, p. 107-115, dec. 2018. ISSN 2502-4906. 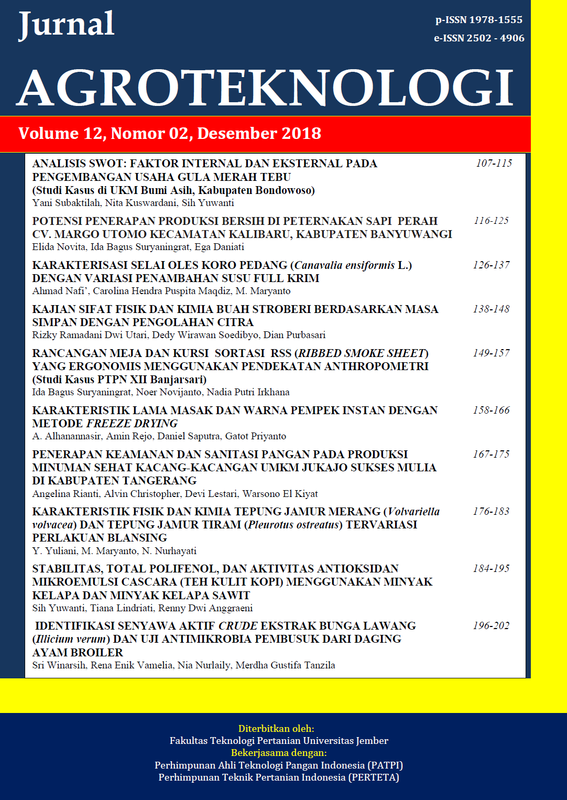 Available at: <https://jurnal.unej.ac.id/index.php/JAGT/article/view/9276>. Date accessed: 23 apr. 2019. doi: https://doi.org/10.19184/j-agt.v12i02.9276.